At the start of 2017, an [article] was published that reported on a new discovery about dinosaur teeth. The authors looked at the teeth of two species of dinosaur – Protoceratops andrewsi and Hypacrosaurus stebingeri. Protoceratops on the left by Z. Chuang and Hypacrosaurus on the right by V. Kontantinov. But not just any teeth. The authors examined the teeth of embryos (an embryo is a baby still inside its egg). Teeth grow day by day, and as they do, they leave lines inside the tooth – much like tree rings inside a tree. By counting these lines (called Von Ebner’s growth lines), we can see how old an animal is. 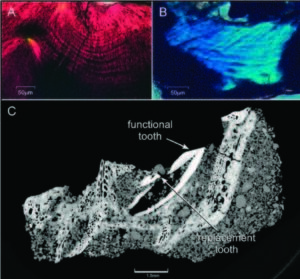 Figure 1 from the paper showing the Von Ebner lines in Hypacrosaurus in A and in Protoceratops in B, and a CT image of the jaw with a functional tooth in C.
But the authors did more than that. We know that embryos do not begin to form teeth immediately, and that sometimes ‘practice’ teeth can form and fall out before the final teeth (called functional teeth) are made. In fact, in crocodiles, functional teeth start to grow about 42% through their incubation period, after the jaws have formed. Using this information, and by counting the growth lines in the teeth, the authors estimated that Protoceratops babies incubate for a minimum of 83 days. The same math gives a calculation of 171 days for Hypacrosaurus. Are you ready yet?? 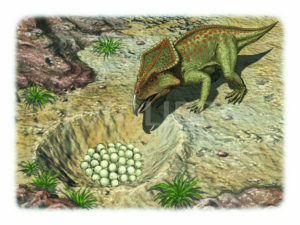 (Protoceratops with eggs by M. Kelly). Today’s birds incubate their eggs for a maximum of 39-83 days (based on the size of the egg and other factors). This means that these dinosaurs incubated their eggs for over TWICE the time that birds today do. In the case of Hypacrosaurus, it’s almost HALF OF THE YEAR. The authors point out that because of these long incubation times, adults and babies were more at risk of environmental changes and predators and could have contributed to their extinction.